Earlier this month Japan’s Technical Research and Development Institute (TRDI), the R&D arm for the MInistry of Defense (MOD), debuted its Medium Combat Vehicle (MCV). Operated by a four-man crew, the MCV supports a turret armed with a 105mm main gun. 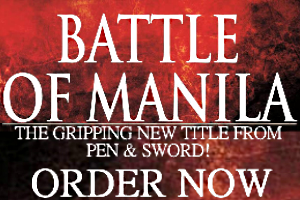 None of its specifications have been officially published. The introduction of the vehicle is in line with the recent shift of the Japan Self-Defense Force (JSDF) to meet any potential threat posed by Chinese encroachment on Japanese territory. As a result, there has been a very public discussion of reforming the JSDF. The MOD has gone so far as to announce the creation of an amphibious branch under the Ground Self-Defense Force’s command. Below is footage from the MCV’s first and only press conference at a Sagamihara, Kanagawa Prefecture, facility on October 8. The MCV takes after its peers like the Chinese ZBL-09 and the Italian Centauro, providing firepower on a light amphibious and air-transportable chassis. The MCV’s other weapons include two machine guns, a .50 caliber Browning on its turret with another co-axial 7.62mm beside the main gun. Known countermeasures include rows of smoke grenade dischargers on either side of the turret, which has two optical periscopes for the commander and gunner, as well as ports for laser sensors. The driver sits on the left-side of the main gun, entering the vehicle from an overhead hatch. 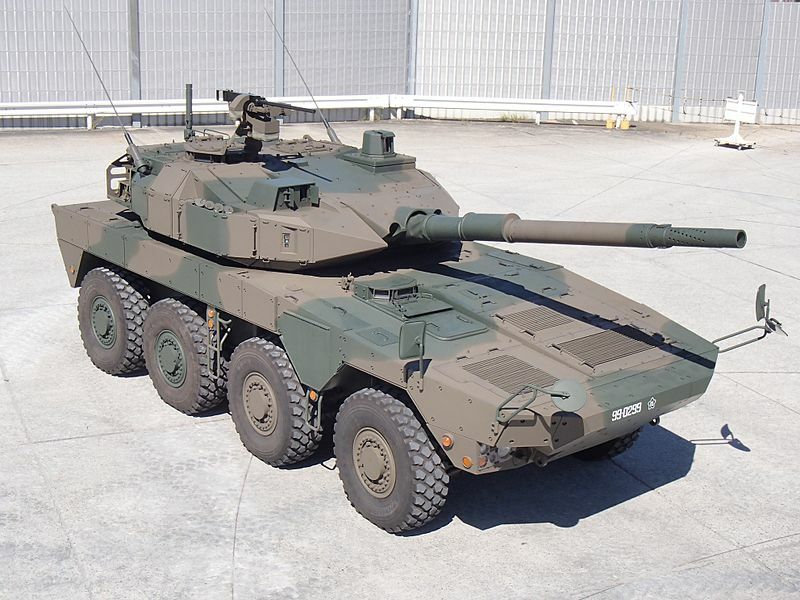 Japan’s Technical Research & Development Institute (TRDI) has rolled out a prototype of what it calls the 105 mm Maneuver Combat Vehicle (MCV). This 8×8 vehicle, which was unveiled by the TRDI’s Ground Systems Research Centre at Sagamihara, Kanagawa Prefecture, has been developed to meet requirements for a vehicle with a high level of strategic mobility and firepower that can be rapidly deployed by air, land or sea. Local media reported that Mitsubishi Heavy Industries will manufacture the MCV, with the first units expected to enter Japan Ground Self-Defence Force (JGSDF) service in Fiscal Year 2016. 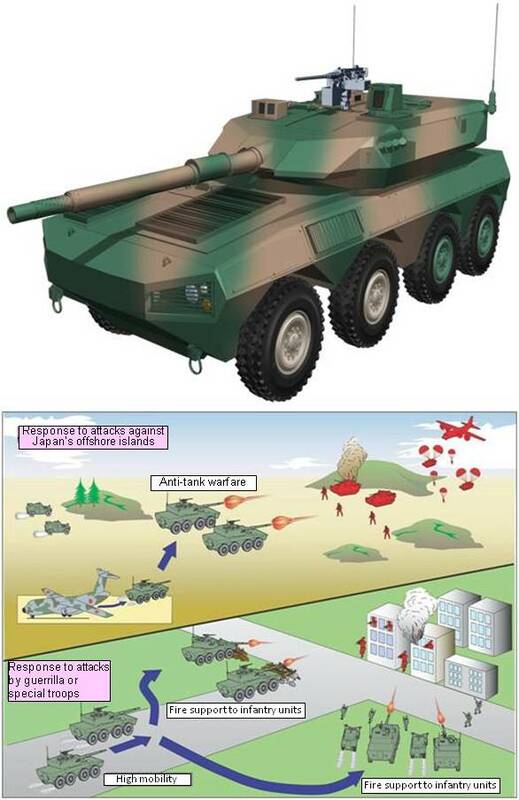 The JGSDF currently deploys the 105 mm-armed Type 74 tracked self-propelled howitzer and 120 mm-armed Type 90 and Type 10 main battle tanks but these cannot be used in all types of terrain and can only be transported over long distances by heavy equipment transporters. The MCV has a reported maximum speed of up to 100 km/h and with a combat weight of about 26 tons, is more agile than its tracked predecessors. It also matches the minimum payload of the new Kawasaki C-2 tactical transport that Japan is building. The MCV’s turret is mounted towards the rear of the hull and is armed with a 105 mm rifled gun that features a pepper pot muzzle brake, thermal sleeve and fume extractor. The gun is laid onto the target by a computerised fire control system that includes day/thermal sights for the commander and gunner. The commander has a panoramic roof mounted sight, indicating that hunter/killer target engagements could take place. A 7.62 mm machine gun (MG) is mounted co-axial with the main armament and there is also a roof-mounted MG. The all-welded hull and turret has appliqué armour and it is possible that laser detectors are fitted to form the first element of a defensive aids system. In concept the MCV is similar to the Italian 105 mm Centauro (8×8) armoured car/mobile gun system, 400 of which have been built for the Italian Army and 84 for the Spanish Army. Italy has also developed the Freccia armoured infantry fighting vehicle (AIFV) and a complete family of specialised versions using components of the Centauro. It is probable that Japan will use the baseline MCV as the basis for a complete family of 8×8 wheeled vehicles and there is also the potential for a 120 mm version in the longer term.